Have you been to our Vitasave.ca retail store in North Vancouver yet? If not, you're missing out because not only do we have the same great service, quality products and warm smiles but we also have the North Shore's first superfood smoothie bar! Our extensive menu offers a delicious and highly nutritious selection of superfood smoothies to keep you nourished and glowing by the glassful. What are superfoods? Superfoods are nutrient dense foods. This simply refers to the ratio of macronutrients (vitamins, minerals, antioxidants and phyto-chemicals) per calorie. Superfoods provide the body with endless benefits, so what's the quickest and easiest way to consume them? In one of our deliciously wholesome, 100% organic, plant based superfood smoothies available from our rocking, in store smoothie bar! This smoothie is chock full of youthful goodness and will keep you glowing inside out. Ingredients Organic strawberries Organic banana Organic acai berry powder Organic goji berries Enhanced Collagen Organic coconut oil Organic apple juice Coconut water Acai berries have long been revered by indigenous cultures of the Amazon. Considered to be one of South America's most important superfruits, acai berry is rich in vitamins A, B, C, and E, and will help revive your skin, heal damaged cells, and restore moisture. In traditional Asian Herbal medicine, Goji berries have been used to promote vitality and well being. China’s legendary first emperor attributed his long life to this precious berry. 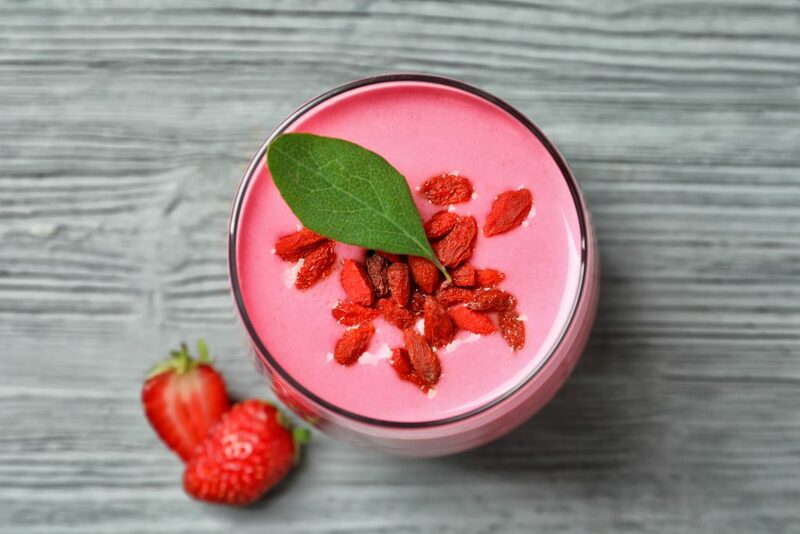 For this reason it is commonly referred to as “The Longevity Berry.” Goji berries are a source of Vitamin A, Vitamin C and Iron. They also contain essential amino acids, trace minerals and Vitamins B1, B2, B6, Vitamin E, carotenoids and a host of antioxidants. Coconut oil's antioxidant effects can help protect against free radicals—much like Vitamin E does—as well as heal and repair damaged skin. The medium-chain fatty acids are easily absorbed, can strengthen connective tissue and help with exfoliation. Bonus: coconut oil also stimulates thyroid function and helps cholesterol to be converted into anti-aging steroids that lower the risk of cancer and heart disease. Collagen is essential for the health of your skin, hair and nails and for maintaining healthy joints. As collagen production decreases with age, adding a naturally sourced collagen supplement, like the one we use in our smoothie, will help counter the negative impact. So come by and try a Fountain of Youth superfood smoothie for yourself. We'll be waiting for you at the bar! Next article mykind Vitamin Sprays for Health on the Go!